the devil doesn’t have any new tricks. – sam finds faith. the devil doesn’t have any new tricks. Genesis 3 tells the story of the fall. You know it well I’m sure: the serpent comes, the crafty devil, to Eve and tells her, in short, that God’s been holding out on and lying to her. He tells her God can’t be trusted when he says that she won’t die if she eats of the fruit of the tree of the knowledge of good and evil (v.3:4), when God promised a spiritual death to Adam back in Genesis 2:17. And as I read this today, through the lens of a young wife that Satan has thrown temptations at, as a friend to other young men and women tempted by the devil to substitute their wives’ or husband’s failings in the affections and sometimes arms of another, and as the mother to a daughter, I realized today that temptation – and I’m talking to wives most specifically – that the temptations we face today is exactly the same BS lie that Eve faced that day. Everything the enemy throws at us to tempt us is the same thing he thew at Eve: that God can’t be trusted. 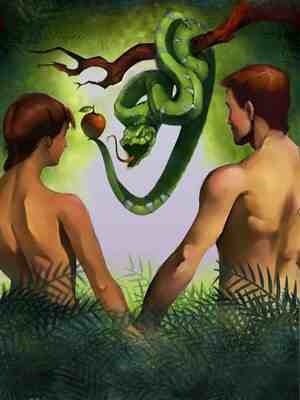 He isn’t any more clever than he was that day, and we aren’t any more gullible than our mother, Eve. When you think the grass might be greener on the other side, with this other guy, it’s a lack of trust that God can bear good fruit in your marriage (John 15). When you find yourself questioning if you married the right person, it’s a lack of trust that God is a sovereign God who has been working out His good and perfect will in your life (Jeremiah 29:11). When you compare your husband and tell your friends he’ll never change, it’s a lack of trust that God can and is at work in the heart of your husband (Philippians 1:6). When you nag your husband about his shortcomings when he is not walking with the Lord as he should, it’s a lack of trust that, when God said he would be won over by your chaste and respectful spirit (1 Peter 3:1-2). And on that last note, I have to encourage you, sister – if you’re IN this spot in your marriage, pursue God in YOUR own life. Don’t tear down your husband and tell him all the time why he’s a terrible leader or making you so unhappy. Psalm 14:1 says: “The wise woman builds her house, but with her own hands the foolish one tears hers down.” Build. Him. Up. It will yield better results. Stop focusing SO much, all of your energy and effort on the failings of your husband and take time to study just who God designed and commanded YOU to be, and as your work out your salvation (Philippians 2:12), work out how to be that woman and let GOD convict the heart of your husband and let the Holy Spirit do its transforming work in his heart by his witness of the work of the Spirit in YOU. May we humble ourselves before the Lord. May we guard our hearts with the Word of God, that the devil might not convince us that we’re better gods of ourselves, our husbands, or our families than He is, or that we’re a better Holy Spirit than He is. There is NO God like Jehovah. Previous postI don’t want to write this blog post either. Next postnothing stays secret forever.